After starting to read Gaby Natale’s book, El circulo virtuoso: Lo que buscas ya está en ti. Libéralo (Spanish Edition) , a memory that I tell during my coaching sessions or during my speaking engagements and corporate trainings, came to my mind. That memory of my years as a swimmer. 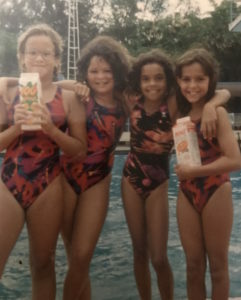 I got started in the beautiful sport of swimming when I was only 2 years old. At that age, I remember it like if it was yesterday, I was thrown out of a trampoline into the deepest end of the swimming pool at the apartment building where I used to live. My heart skipped a bit…but I didn’t drown! 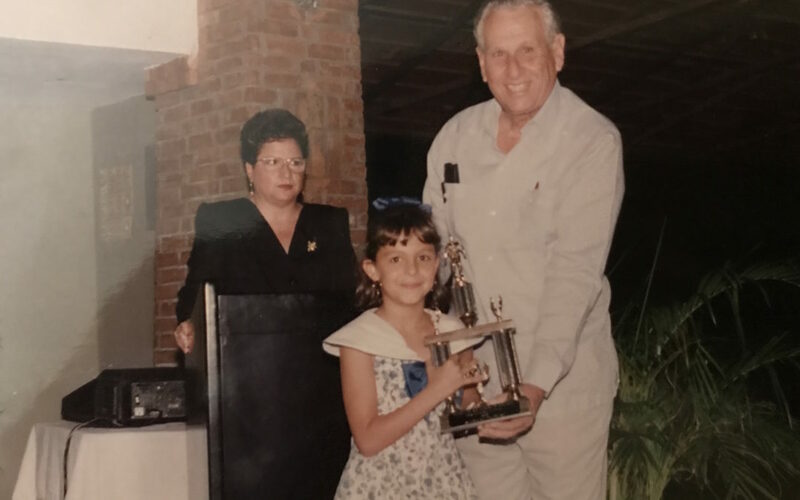 When I was 4, my parents decided to sign me up to a swimming team and competition after competition I was able to conquer the goals that I had set for myself. It was 8 years of trainings, achievements, celebrations and failures. My passion for swimming was so strong that, even though I had been separated myself from it for some years, I signed up to the varsity swim team as soon as I got to New York for college. It was there the I enjoyed two more years of this wonderful sport. Having met amazing people whom, up until today, 29 years later, are still present in my life. I built friendships that, even at a distance, have kept strong. In my trips and competitions, I had the fortune of always being accompanied by my siblings, also swimmers, and my parents who have always supported me unconditionally. Right before ever meet, I would listen to music, dance, laughed, talked to my teammates, celebrated their wins and would support them at all times. I was only a child, but it filled me with satisfaction being there for others and to dream and visualiza my own triumphs. Obviously I didn’t analyze it so deeply when I was a kid, but that was the beauty of being a kid! Like they say in my country “no le daba mente” (I didn’t think about it) and I would move forward. I remember walking every time towards the platform, stand there, breathe, and wait for the whistle and that’s when my mom would suffer (although I know that deep inside she would smile and enjoyed it). For some odd reason I would swim LAUGHING! not smiling… literally LAUGHING. In true honesty I still don’t know how I never drowned! I would laugh seeing my teammates cheering for me next to the pool, not because I found it funny that they would be cheering for me, but because while I was in the water, I would hear interrupted screams and silly faces that I didn’t understand. I enjoyed it and I would feed from their energy and my vision of winning to move forward and reach the finish line. “That dreamer that we discover in a pure state when we are kids lives within us. It doesn’t die when we grow up. Many times is hidden y its voice is not heard. It tries to talk to you, but with time we start to make noise. hacerle oídos sordos. As we grew up, the voices of logic told it to shut up, tagged it as crazy, of living in an unrealistic world and of looking for impossible goals. but, your dreamer self is still there. Look for it. Claim it.” #ElCírculoVirtuoso @GabyNatale.